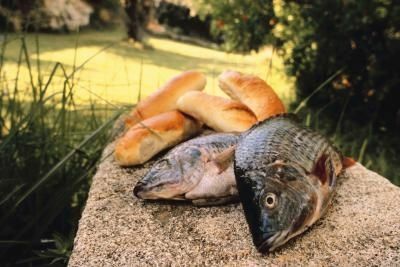 Feeding of the 5000: How much food was there? Sometimes, the Gospels lose their impact on us. Stories become familiar. Reading is superficial. Minds are distracted. Entering into prayer prior to beginning to read and then deeply meditating on scripture can help bring them alive (Lectio Divina). A key way to engage the Gospels is to attempt to dig in deeply, attempting to put one’s self in the Gospels to get a better “eye witness” view of what is happening. Who is the Greatest Man Impressed by Jesus? Hint: water. If you want to know how impressive someone is, look at the impressiveness of their followers. Impressive people follow more impressive people: “A disciple is not greater than his master” (Matt 10:24). 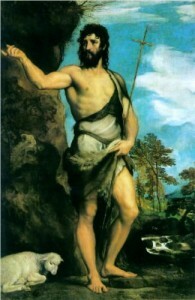 John the Baptist, the son of the elderly priest Zechariah and Elizabeth, after a miraculous conception, grew up and was baptizing in the wilderness east of the Jordan River. His deeds and preaching was so powerful that he attracted a lot of attention and a lot of followers. The powerful Pharisees in Jerusalem are getting nervous because people were saying that John was the long-awaited Christ or a resurrected Elijah, so they sent priests out to question John (John 1:19-28).